Our editors have taken the stress out of planning. Here, a seven-day trip to the South Island, which you can book as one of Travel + Leisure’s Great Adventure trips with Butterfield and Robinson. You’ve probably seen New Zealand’s otherworldly mountains, emerald valleys, and crystal lakes on the big screen, in Peter Jackson’s Academy-award winning Lord of The Rings trilogy or perhaps most recently, in Ava duVernay’s masterful film adaptation of A Wrinkle in Time. But what if you could see it all up close in real life? The editors of Travel + Leisure, along with luxury tour operator Butterfield and Robinson, have planned the ultimate week-long adventure on the South Island of New Zealand, taking you from the picturesque streets of Christchurch to pristine Blanket Bay. Our trip, which you can book as part of our Great Adventures program, offers the perfect chance to see the country in the great outdoors, all the better to appreciate its natural beauty. You’ll experience thrills such as fly-fishing, jet-boating, and more. The editors have even selected a special activity for you: a scenic heli-flight to the Franz Josef Glacier, followed by a two hour guided hike. Read on for a full day-by-day itinerary, and contact Butterfield and Robinson to book this trip, one of seven in our Travel + Leisure Great Adventure series. From $8,795 per person, based upon two people traveling. Touch down in Christchurch, the largest city on the South Island. To get the lay of the land, a B&R guide will take you on a two-hour walking tour of the town, helping you discover its little-known corners and gems. Christchurch is known for its street art scene, café culture, and lovely parks — including Christchurch Adventure Park, home to the longest chairlift in New Zealand. The views at the top of the lift from Port Hills, overlooking the entire city on to the Southern Alps, are quite impressive. Dinner is at your leisure. 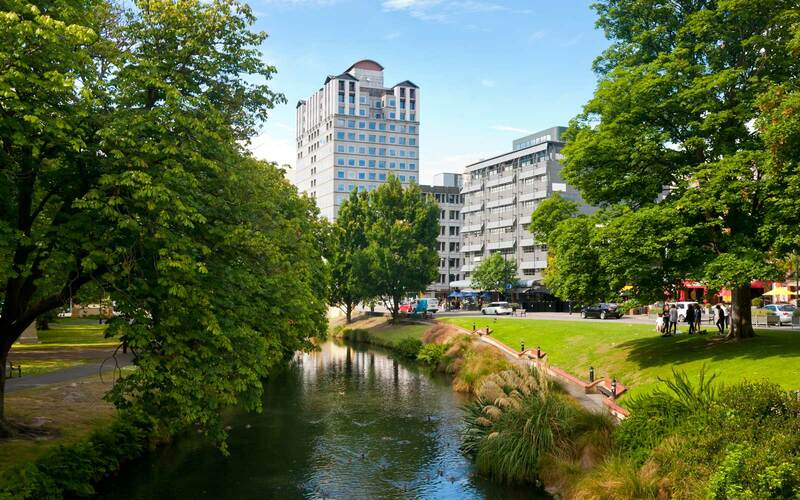 Stay: For one night, you’ll be at the George, a luxury boutique hotel renowned for its award-winning restaurants, stellar service, and impressive views of Hagley Park and River Avon. 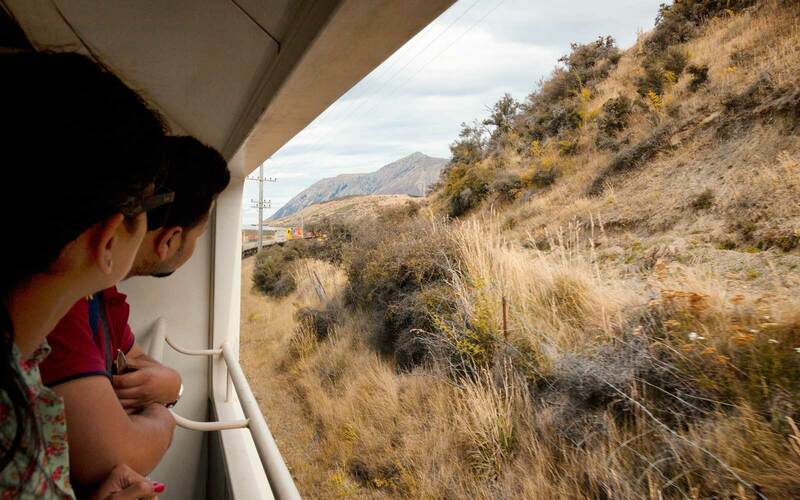 Climb aboard one of the world’s most famous trains, the TranzAlpine, and travel from one coast of the South Island to the other between Christchurch and Greymouth. The train leaves at 8:15 am and arrives in Greymouth at 2 pm. Cross the fertile farmlands of the Canterbury Plains, and enjoy thrilling vistas over deep gorges as you travel alongside the ice-fed Waimakariri River. Traverse the mighty Southern Alps, where spectacular views of the chiseled alpine landscape will astound you at every turn. The New World class carriages, built right here in New Zealand, feature wide panoramic side and rooftop windows with untinted and non-reflective glass, allowing for great photo opportunities. 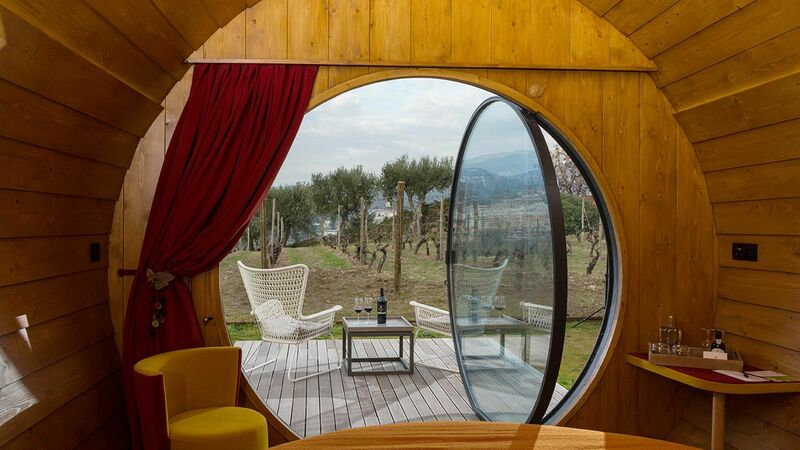 Open-air viewing decks also ensure nothing gets in the way of you and your camera. Upon arrival, your guide will meet you at the station to take you to your lodge for the next two nights. It’s about a 2.5-hour drive from Greymouth to the Westwood Lodge. If time permits and you’re up to it, there are some great shorter walks to explore once you’ve checked in. This evening, your guide will take you into the quaint little town for a casual dinner and discuss the events of the upcoming days. Stay: The Westwood Lodge is a warm, inviting, boutique bed-and-breakfast that perfectly captures the local spirit. Nestled in the heart of Glacier Country, it is just steps away from the majestic Southern Alps and the World Heritage Westland National Park. You’ll be here for two nights. Today is full of amazing highlights, including our editor's pick activity. 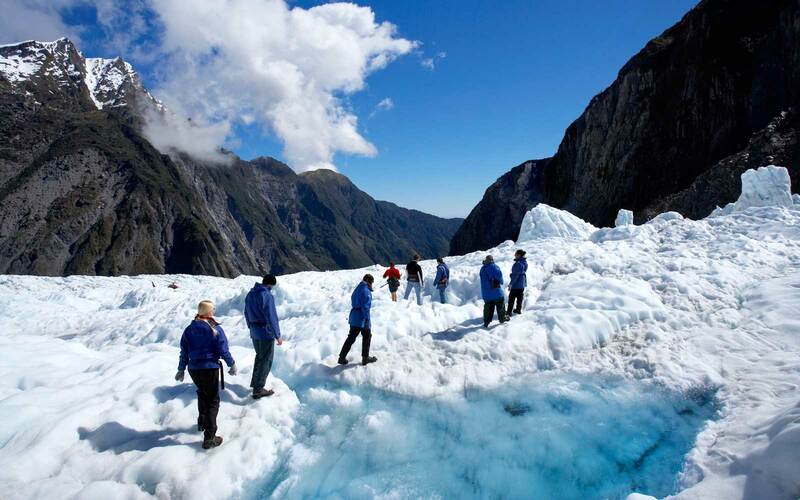 After an exciting scenic flight, you land high up on Franz Josef Glacier and undertake a two-hour guided hike amongst some of the most pristine and awe-inspiring scenery in the world. Your guide chooses the route as you go, based on the day’s conditions and with an eye for the most spectacular ice formations. You'll make your way through a wonderland of towering pinnacles and brilliantly blue ice, and enjoy panoramic views of the surrounding mountains with plenty of photo opportunities. Your day also includes entry into the Main Pools at the fabulous Glacier Hot Pools. Note: Sometimes even the best plans don't work out. If the helicopters are canceled due to weather, Franz Josef Glacier Guides will automatically transfer you onto a Glacier Valley Walk the same day. There is no obligation to participate and you can cancel at any time — we just want to make sure you don't miss out on a great glacier experience. Enjoy yet another sumptuous breakfast before you check out of the Westwood Lodge, meet your guide, and head over to Blanket Bay. In this spectacular corner of New Zealand, discover endless ways to restore your physical and spiritual wellbeing. There is nowhere else on Earth with so many activities close by — fly-fishing and heli-skiing, hiking on the Routeburn or Milford Tracks, jet boating and kayaking, 4WD tours, horse riding, art trails and vineyards, plus flight-seeing over the World Heritage Fiordland National Park and Milford Sound. You’ll spend the next couple of days exploring Blanket Bay and the many activities it has to offer with your private guide. A walk on the Routeburn Track is the ultimate alpine adventure, weaving through meadows and alpine gardens. Along the way, you'll be rewarded with spectacular vistas over vast mountain ranges and valleys. Wind through the Routeburn gorge along the crystal- clear Route Burn (river). 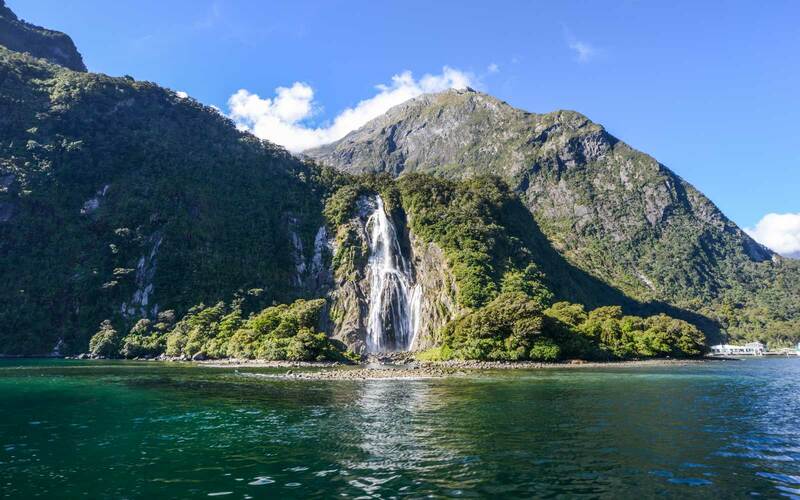 Follow the cascade of Routeburn Falls and return. No trip to the area would be complete without experiencing a classic jet boat trip. From the comfort of our fully equipped vessels, you’ll discover the unforgettable Dart River scenery, as well as have the option of a short walk to hidden rock pools deep in Mount Aspiring National Park. Informative guides add a personal touch, talking about the area’s history, the Greenstone trail and Maori legends. Walk amongst ancient beech forest, unchanged for 80 million years, and view the scenic backgrounds for many Middle Earth movie scenes. After the Jet Boat experience, you will meet your guide at Surveyors Flats for afternoon tea, followed by a three-mile (1.5 - 2 hours) walk back along the Dart Track to the vehicle and back through Paradise to Blanket Bay. Stay: Blanket Bay in Glenorchy is one of New Zealand’s top lodges — and your home base for the next three nights. The lakeside lodge rooms each feature their own balcony or terrace and spacious sitting area. All meals are included, and many activities are available on-site (hiking, kayaking, fly-fishing). 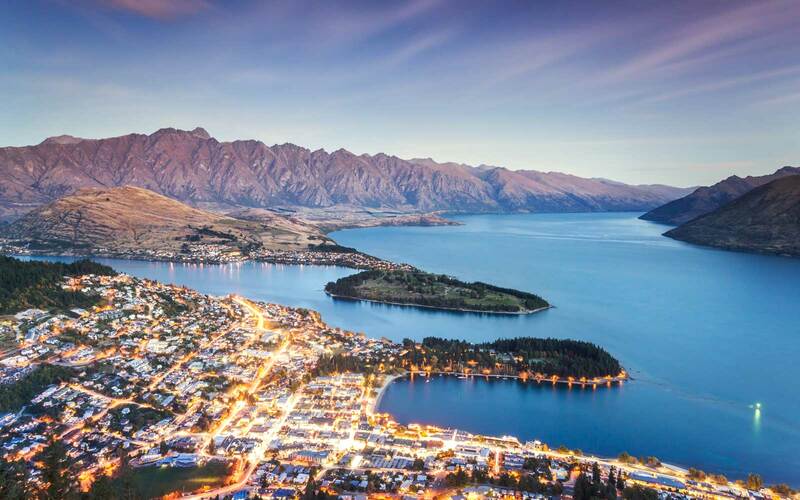 Leave Blanket Bay for Queenstown, the “Adventure Capital of the World.” Your guide will take you on a two-hour sightseeing adventure of this thriving city’s restaurants, shops, and outdoor pleasures, before your return flight home. You can also choose to spend a few nights here and extend your stay.